The quest for power is one the great driving forces of humanity and, by extension, certain individuals in particular. While this lust has been the focal point of several Doctor Who stories before, writer Jamie Anderson has significantly increased the stakes as Lyam Yce seeks universal power on the planet Teymah in the aptly-titled ‘Absolute Power,’ uncovering long-forgotten truths and well-concealed deceptions along the way. Also arriving on Teymah, the Doctor and Constance soon find themselves the benefactors of another case of mistaken identity as they are afforded access to Yce’s archaeological dig attempting to discover what brought about the Anomalous Extinction Level Event of its population some two thousand years ago. With the two leads separated quite early on, ‘Absolute Power’ quickly escalates to a very fast pace bolstered by a constant sense of tension as both parties uncover their own portions of the truth regarding the mysterious sphere and its untranslatable language. In a story filled with duplicity where nobody is really as he or she seems, it’s imperative that the cast is a strong one, and fortunately that is the case in ‘Absolute Power.’ While Colin Baker is enthralling as always as the Sixth Doctor boisterously tries to piece together the moral quandary presented, Miranda Raison is quite possibly the standout star as Constance Clarke continues to develop into a very well-rounded character who in unafraid to stand up to the Doctor and to assert her own knowledge when able, in this case putting to good use her training at Bletchley Park. Paul Reynolds is also quite engaging as Yce, though it’s also quite refreshing that the script calls out his extreme smarminess as a telltale sign that he should not be trusted rather than choosing to ignore this bit of characterization. Jenny Bede as Florrie, Arian Nik as Ammar Elkady, and Neil Edmond as Professor Aryan Wyke also do admirably in bringing this duplicitous script to life believably, especially once the hidden alien menace makes itself known. Anderson doesn’t necessarily present completely novel ideas, but the manner in which those ideas intersect and unfold is constantly engaging and surprising. There is the unfortunate necessity of introducing a new piece of technology that the Doctor claims he has been working on for several regenerations in order to hold the plot together at a crucial point later on, but it’s an issue of convenience and the overall quality of the script makes it fairly easy to overlook. 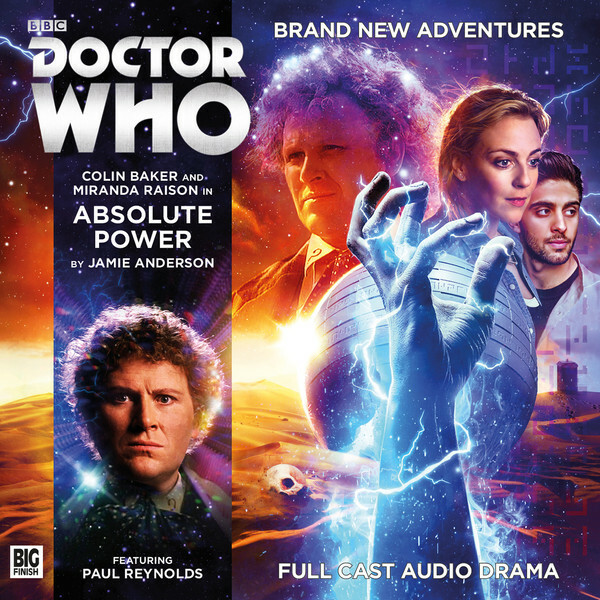 With a breakneck pace, superb performances, and an immensely powerful foe who would make for a most welcome return appearance, ‘Absolute Power’ is another strong entry into Big Finish’s Sixth Doctor timeline, and the relationship between the Doctor and Constance is becoming increasingly fascinating and dynamic.